The 8th Territorial Legislature adopted the Alaska flag design which had been selected in a contest for Alaska students the previous year. 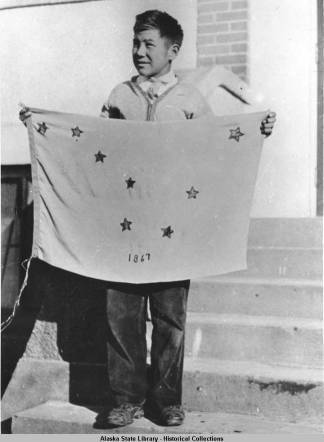 The winning design, submitted by 13-year-old Benny Benson, a part-Aleut young man, consisted of eight gold stars on a field of blue, representing the Big Dipper and the North Star. Provided for the erection in Sitka of a monument to commemorate the transfer of Alaska to the United States. Charles Lindbergh makes the first trans-Atlantic flight (1927). Leon Trotsky is expelled from the Soviet Communist Party leaving Joseph Stalin with undisputed control of the Soviet Union (1927). The U.S. Federal Radio Commission (later renamed the Federal Communications Commission) begins to regulate the use of radio frequencies (1927). The Meriam Report, conducted by the Institute for Government Research (which becomes the Brookings Institution), finds that the U.S. government is failing at its goals of protecting Native Americans, their land, and their resources, both personal and cultural (1928). It is the first major report to document and bring to the nation's attention the plight of Native Americans. The report is also highly critical of American Indian education. Herbert Hoover is elected President of the United States in 1928.